Those expecting a typical runway show were in for a surprise; the models all had at least six legs, nobody was showing off the latest fall collection, and the paparazzi consisted of a group of art students at Johnston Middle School. 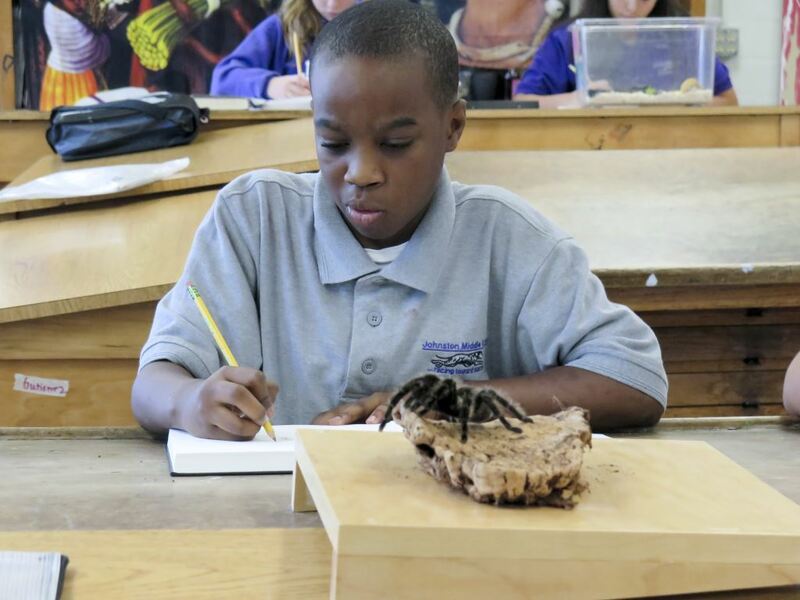 A student concentrates while sketching one of the eight legs on Peanut, the Costa Rican Curly Hair Tarantula. Peanut was very cooperative and stood still the whole day for the classes. 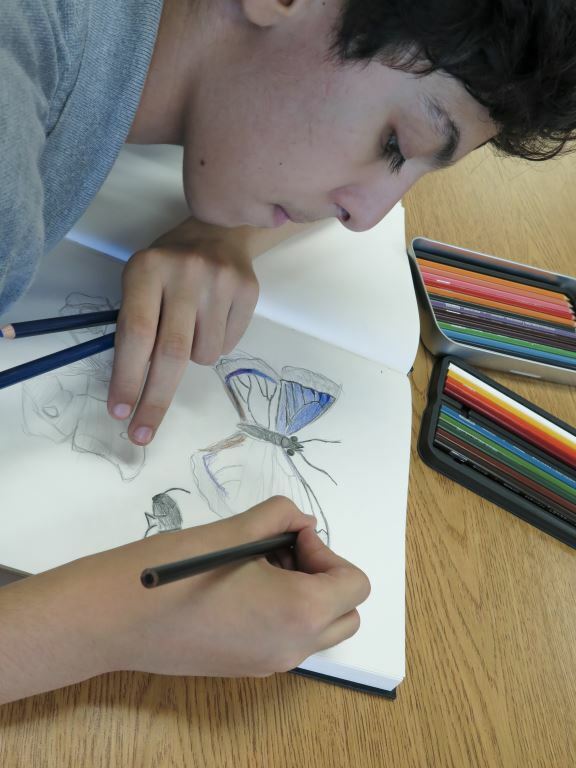 HMNS’ LyondellBasell Bugs On Wheels traveled to Christina Gutierrez Gonzalez’s art class October 1-2 to model for a group of talented middle school artists. Exotic specimens from the Cockrell Butterfly Center’s insect zoo spent the days playing muse as the students learned about the arthropods and practiced their sketching. 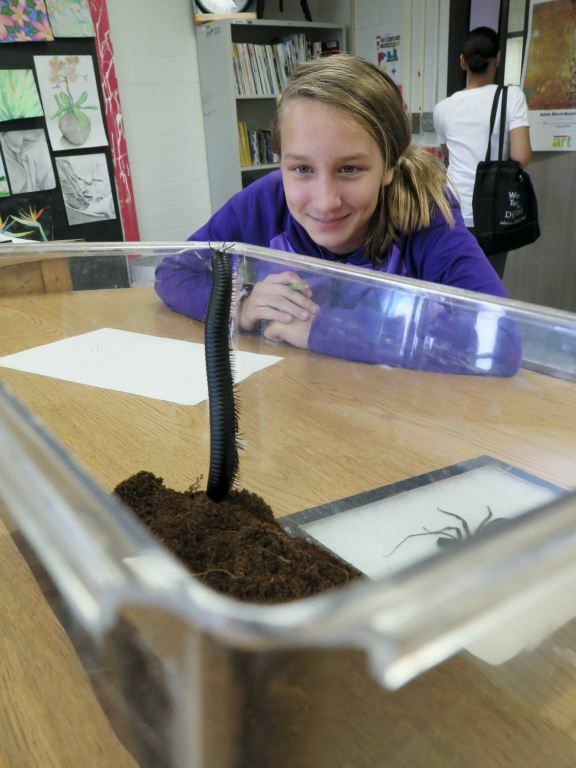 A student smiles while observing a Giant African Millipede attempt to escape its plexiglass enclosure. While it is just a little too small to get out right now, this millipede is expected to grow up to one foot long. 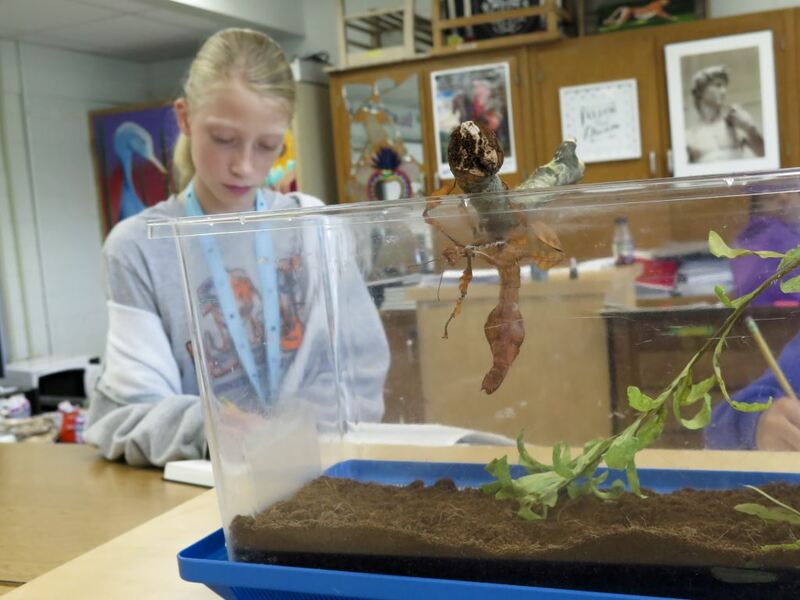 In February 2013, Gonzalez booked the TOTAL Wildlife On Wheels program for the same purpose, and after the presentation yielded fun and fantastic artwork, she decided to try it again, this time with bugs. A student sketches a Giant Prickly Stick, who is just trying to blend in with his stick. This species of walking stick will curl its abdomen and mimic a scorpion if threatened. Many students got the chance to draw multiple of the five live and five once-living arthropods present. A student colors in the wings of a Blue Morpho butterfly. While the butterfly’s upper wings are a brilliant, bright blue, the undersides are a darker brown with eye spots. 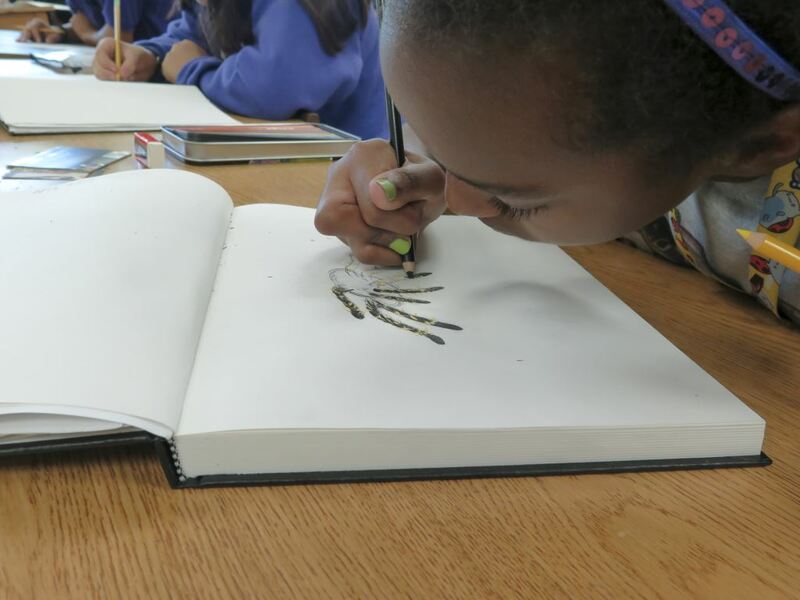 While the bugs lounged around, the students were hard at work, carefully drawing outlines in their sketchbooks and filling in gaps with pencils. 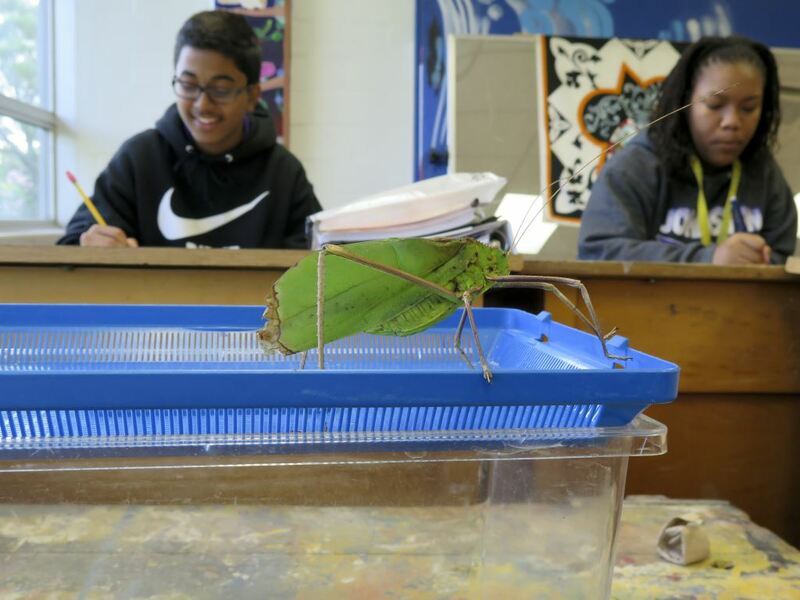 Two students draw the outline of Stewart, the Giant Long-Legged Katydid. This species of katydid may be the largest and loudest in the world, but they are herbivorous and very gentle; Stewart was a very good model! A student colors in the legs of Peanut with alternate bands of black and yellow. Peanut, like all arachnids, has eight legs and two main body segments. Bugs On Wheels and our other Outreach programs, such as TOTAL Wildlife On Wheels, ConocoPhillips Science On Stage, and Chevron Earth Science On Wheels, bring the wonders of the Houston Museum of Natural Science to you through hands-on and interactive presentations. For further information on these programs and more, visit our HMNS Outreach website or send us an email at outreach@hmns.org! 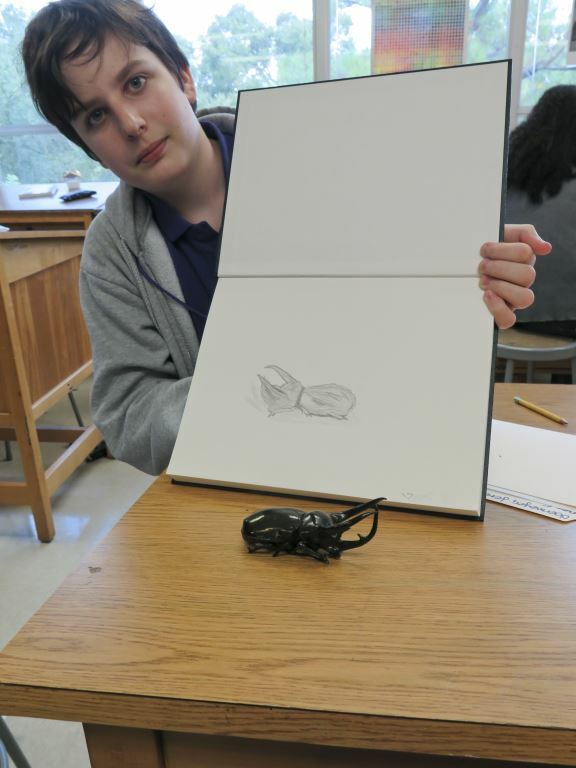 A student shows off his finished rendition of an Atlas Beetle behind the specimen itself. While its horns look scary, these beetles are not harmful to humans and are often kept as pets. For more information on HMNS’ outreach programs, click here. For more information on LyondellBasell Bugs on Wheels, click here. What a great tie between science and art. Observation is the key to understanding our world and this ties two types of students to a common goal. Great job! Do more! Next Post There's a Partial Solar Eclipse Happening October 23: Here's what you need to know to see it!